Pappos wrote some 700 years after Archimedes. The influence of Archimedes then was alive. Pappos and his contemporaries used the machines Archimedes invented. Pappos also had the works of Archimedes. Enough of those works survived to our day providing evidence he was a genius in mathematics and mechanics. Archimedes was fundamental for modern science, which moved the world. Archimedes was born around 287 BCE in Syracuse, a powerful and rich Greek state in Sicily. The age of Archimedes, the third century BCE, was a time of prosperity and creativity for the Greeks. In late fourth century BCE, Alexander the Great conquered the then known world. It was the legacy of that global expansion that set the foundations for the Greek achievement, especially in science. In fact, the time of Archimedes was the golden age of Greek science. Archimedes probably studied in Alexandria, a city built by Alexander the Great. Alexandria was not merely the capital of Greek Egypt but the capital of culture, competing vigorously with Athens. The Ptolemies, Greek kings of Egypt, reproduced in Alexandria the school of Aristoteles, by far the greatest Greek natural philosopher. Aristoteles shaped the nature of science and made original contributions to biology. So the Ptolemies had grand ambitions to continue the work of Aristoteles. They built the two institutions Aristoteles had in his school in Athens: a Mouseion, a temple of the Muses or goddesses of learning, and a library, which became the greatest and largest library of the ancient world. But the innovation of the Ptolemies also included funding of research and advanced studies of science and engineering. In other words, the Ptolemies set the foundations for a modern-like university for science and technology. Archimedes breathed the excitement of Alexandria. The friends he made in Alexandria were scientists who also advanced the frontiers of natural philosophy and mathematics. He sent his works to these Alexandrian scientists in the form of letters. The works of Archimedes were copied and spread widely not merely in the Greek world but, a millennium later, among the Arabs and Europeans. The works that made it to the fifteenth century Renaissance triggered advances in mathematics and mechanics, boosting modern science. Since 1974 and, especially, during the first decade of the twenty-first century, Archimedes is, once again, coming into his own. In 1974, Derek de Solla Price, a British historian of science published “Gears from the Greeks” where he demonstrated the Greeks had advanced technology more than 2 millennia ago in the form of an astronomical computer known as Antikythera Mechanism. In 1998, a wealthy American purchased the Archimedes palimpsest, a Christian prayer book, which, under its hymns and prayers, had the “Method of Mechanical Theorems” and some other works of Archimedes. The Christians created palimpsests by scrubbing Greek texts off parchments in order to reuse the parchments for writing their books. Finally, in 2005, a group of international scientists decoded in more fascinating detail the Antikythera Mechanism and confirmed the findings of Price. The Antikythera Mechanism was indeed an astronomical computer run by advanced technology the likes of which appeared for the first time in Europe in the sixteenth century. The clockwork mechanism was the technological marvel of ancient Greece, which came through the legacy of Archimedes. Two books published in 2010, “The Great Archimedes” by the Italian classical scholar Mario Geymonat and published by Baylor University Press and “The Genius of Archimedes,” published by Springer and edited by two professors of engineering, Stephanos Paipetis from Greece and Marco Ceccarelli from Italy, are like the icing on a cake about the “rehabilitation” of Archimedes in the public mind and Western literature. Geymonat’s story is wonderful, short, and to the point: He sees Archimedes as “a great theoretician and a model of scientific ingenuity” and “inimitable” inventor. Reviel Netz, professor of classics at Stanford University and translator of Archimedes, considers him to be “the most important scientist who ever lived.” Archimedes was, indeed, great. The man was a genius that brought heavens and earth together. Archimedes probably created the first mechanical model of the universe. Marcellus, the Roman conqueror of Syracuse, brought to Rome the planetarium of Archimedes. We hear praises of this planetarium from the Roman politician and writer Cicero in the first century BCE. By the second century BCE, the ideas of Archimedes led to the development of the world’s first computer, the Antikythera Mechanism. Archimedes used geometry and mechanics to invent machines in order to make human life better and easier. For example, the Archimedes snail-like screw was a water pump still in use in Egypt and elsewhere. The winches and pulleys, often known as Archimedes’ block and tackle, never went out of fashion or use. Moreover, Archimedes’ measuring of curves prepared the ground for calculus. He invented combinatorics or the theory of probability. These mathematical advances help us send objects into space while underlying imaging science that was so valuable in deciphering the Archimedes palimpsest and the Antikythera Mechanism. Archimedes also invented statics, hydrostatics and mathematical physics. And when the need arose, Archimedes put his inventive mind to work defending his fatherland, Syracuse, against the Romans. Like other scholars before him, Geymonat argues that Archimedes was crucial in the Renaissance, becoming the seed that flowered into modern science. Geymonat says Archimedes in the Renaissance was “one of the main driving forces in the great renewal of science that spilled over into subsequent centuries.” Archimedes also remains a model of how one does science. This links us to the book of Paipetis and Ceccarelli bringing the modernity of Archimedes into light as never before. “The Genius of Archimedes” is a collection of 38 articles authored by 60 international scholars, most engineers and scientists. They met in Syracuse, June 8-10, 2010, for an international conference devoted to Archimedes. Just like Geymonat, who was also a participant to the Syracuse conference, they concluded that Archimedes was a founding father of modern mathematics, science, and engineering. They traced the influence his thought had in the making of Western culture. In fact, Archimedes’ influence also reached the Arab world and China. The 60 international scholars succeeded in documenting both the technical and historical legacy and influence of Archimedes. They shed light on the contributions Archimedes made in hydrostatics, statics, mechanics, mathematical physics, integral calculus, machines and mechanisms, and mathematics. The real influence of Archimedes in the West started in the Renaissance. The Dutch genius in statics and hydrostatics, Simon Stevin, was the most faithful follower of Archimedes in the Renaissance. In fact, there was an Archimedean Renaissance among scientists and engineers in the fifteenth and sixteenth centuries. Galileo Galilei cited Archimedes more than 100 times, always expressing his affection and deep respect for the old man of Syracuse. In the eighteenth century, Isaac Newton was brought up by the thought of Archimedes. “The Genius of Archimedes” includes several stories of the Archimedean beginnings of modern machines and mechanisms: 6 chapters focus on the legacy and influence of Archimedes on mathematics; 8 on engineering and the design of mechanisms; 6 on hydrostatics; 4 on philosophy; 7 on science and technology; and 7 tracing the legacy and influence of Archimedes on teaching and history. Another contributor, an Italian scholar named Cettina Voza, examined the ancient literary evidence about the death of Archimedes in 212 BCE. She argues that Archimedes did not die at the hands of a lone Roman soldier while he was playing in a sand box drawing geometrical figures. On the contrary, Voza says, the Roman state “assassinated” Archimedes because his weapons had caused enormous damage to the Roman forces attacking Syracuse. This argument, insightful and convincing, overthrows the literary evidence from ancient Greeks and Romans who, imitating one another, presented a pro-Roman view about the death of Archimedes, the archenemy of Rome. Remember late third century was a time of war for Rome, fighting Hannibal and the Carthaginians for decades for supremacy in the Mediterranean. The prospect of Archimedes going to Hannibal must have kept Roman strategists awake at night. So Archimedes had to die. 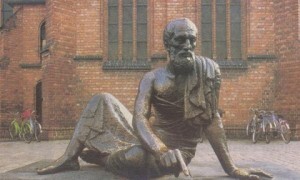 Marcellus shed crocodile tears for the death of Archimedes, which he had planned. The death of Archimedes, however, cost science dearly. Of the two books, Geymonat’s “The Great Archimedes,” was the easier to read and enjoy, though Geymonat is wrong in suggesting that the reason ancient Greeks did not industrialize was the abundance of slaves. If such a claim was valid, why did the industrialization of Europe and America take place when slavery thrived in both continents? No, the reason industrialization failed in Greece was Christianity. Geymonat and the authors of “The Genius of Archimedes” remain silent on the Christianity effect: the tsunami-like violence of Christianity in uprooting the scientific and technological infrastructure of Greece. What the Christians did to some of the works of Archimedes, scratching them from the parchment and writing over the deleted works Christian prayers, they did it to Greece, making the country a palimpsest. The science of Archimedes survived by the skin of his teeth. Some of his works, including “The Method,” barely made it in a palimpsest decoded in early twentieth century and recently. Both books complement each other, one “The Great Archimedes,” providing an introductory overview of the science of Archimedes and the longer, more technical book, “The Genius of Archimedes,” providing details of science and influence of Archimedes in the making of modern science. Both books highlight the life and works of a mathematical and engineering genius that, in the apt phrase of Reviel Netz, read the book of nature. Archimedes used geometry and mechanics to enrich and explain each other while directing his inventions to the satisfaction of human needs and national defense. Geymonat may be right: Archimedes “cultivated science with the spirit of an engineer rather than a professor.” Geymonat should know. He is a professor. Evaggelos Vallianatos is the author of “This Land is Their Land” and “The Passion of the Greeks.”.